If you are a parent, you’ve said this more than once because rare is the person who is born patient. We want what we want, and we want it now. So what is patience? A combination of definitions that I found during my research is this: patience is doing something in a careful way over a long period of time without hurrying. After studying many definitions, my brain was still hungry for a little more information, so l looked up the root word of patient and found that it is the Latin word patiens, which is the present participle of pati, meaning “to suffer.”1 Finding that little bit of Latin trivia helped it all make sense to me. Now I understand why sick people are called patients — and why it so often feels like suffering when we have to wait. Teaching some of our busy little ones to be patient is another reminder of the connection between patience and suffering. It can be as difficult as trying to stuff a square peg into a round hole. Some kids just seem wired to move quickly, and their skill set does not include patience or calmness. We know that our personality or temperament affects how we approach every aspect of our lives, but having a certain personality type doesn’t change what God calls us to be. Romans 12:12 tells us to “be joyful in hope, patient in affliction, faithful in prayer.” Moms, some of us have children who are not calm or patient by nature. These kids seem to have one foot out the door at all times, and for them being patient practically requires a ball and chain to hold them back. Being patient is a skill that can be practiced and, while probably not completely mastered, improved upon. It’s a life-changing skill! I put an exclamation point at the end of that sentence so you would really take it to heart. 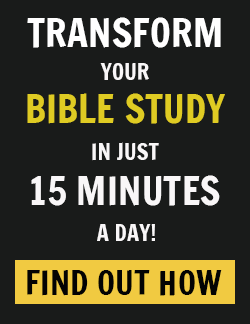 Life-changing! Patience can lead to blessings beyond our wildest dreams, while a lack of patience can cause us to miss a blessing designed for us. God rewards those who successfully wait on Him, and to those who do not, He gives more time to practice their patience skills. We are given many examples in the Bible of this being true. Remember the plight of Abraham in the Bible? God promised Abraham that his descendants would be as numerous as the sands on the seashore. 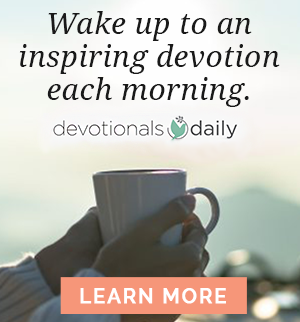 Abraham was beginning to doubt God’s fulfillment of this promise, as he and his wife, Sarah, were well past childbearing age and no baby was in sight. So Abraham took matters into his own hands and slept with his servant, Hagar, in order to have a baby with her and “help” God out. The full account of Abraham’s lack of patience can be found in Genesis 16. Little did he know that God had a better plan. When Abraham was one hundred years old and Sarah was ninety years old, their son, Isaac, was born. It is through Isaac’s line that our Savior, Jesus, was born. Jacob served seven years to get Rachel, but they seemed like only a few days to him because of his love for her. What a beautiful example of patiently waiting for a promised reward. Then we have the example in the New Testament of the son who decided he was tired of waiting for his inheritance and asked his father to give it to him early. He wasted his inheritance and woke up in a pigsty with no money left to live on. In today’s world we’d describe the foolish son in Luke 15 as being unable to delay gratification. The ability to delay gratification is patience. We live in a “microwave” world. Given the fast-paced nature of life today, patience may seem like the most outdated of all of the character traits. We put our food in a microwave oven, and if it’s not warm in thirty seconds, we’re irritated. In fact, waiting for popcorn for two and a half minutes is asking too much of us. We drive through a restaurant and expect warm food in our hands before one song is finished on the radio. If there’s a delay and we’re asked to pull off to the side and wait for three minutes, we do so but not without complaint. We turn on our computers and, if the website isn’t up in less than five seconds, we complain that we have the slowest Internet carrier in the whole world. Some of these examples might be exaggerated, but we truly are an impatient society. How great it is that our God is patient — even allowing us to have second chances. He waits patiently while we first try following our own path. Never turning His back on us, He holds us in His hands until we return to Him. I’m so grateful that He looks more closely at my heart than at my actions and patiently waits for my actions to be more reflective of my heart. 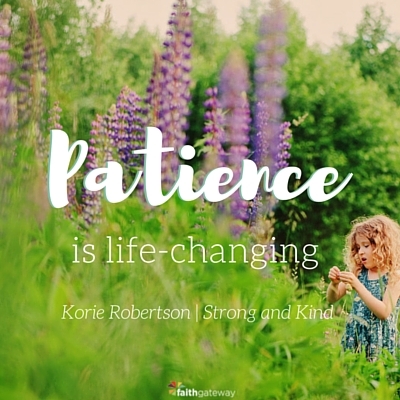 Our God knows the value of patience, and if we truly love our children, we will do all that we can do to help them develop this character trait. An important aspect of patience is contentment. To be patient you must be content in the circumstance you find yourself in while you wait. The definition of content is to be in a state of peaceful happiness, satisfied. Can you say that you are satisfied? One of the problems in our society today is that we are never satisfied. We’re always looking for something bigger, better, and faster. This has caused a culture in which young people jump from school to school, job to job, and move from town to town, never sticking with anything long enough to actually see the fruits of their success. I’ve often said that one key to the Robertson family’s success in business and in life comes from being content. The first year of Duck Commander, the business brought in only twelve thousand dollars. Not nearly enough to support a family of four growing boys and Granny and Pa, who lived with Phil and Miss Kay at the time. The second year wasn’t much better. As a matter of fact, the first year Duckmen of Louisiana (the Duck Commander hunting DVD) was made, which was about ten years after Duck Commander started, only 600 copies were sold. Most people would have closed up shop and gone back to school teaching and coaching, but the Robertson family was patient. They gave the business time to grow, and during that time, they were content with what they had. They counted on commercial fishing to supplement their income. They ate what they caught in the river and what they killed and grew on their land. In their minds they had plenty. Willie says even though they qualified for free lunch at school because of their income, he never thought of his family as poor. They rarely bought new things, but they always had enough to eat, and there was plenty of happiness and joy in their home. There were many times when they could have given up and quit. Had they not been patient and content, Duck Commander never would have made it past the first few tough years. And millions of Americans would not have celebrated our fortieth anniversary with us on Duck Dynasty. Being kind was tough in a house full of boys, but being patient was even harder. Just sitting down at the dinner table was a test of patience. We all wanted the best piece of chicken or the biggest potato. After Dad said the prayer, it was game on, and we started reaching for the food. But there were ways we learned this important trait, and one of them was just by living in the outdoors and hunting and fishing. I’m not the most patient guy and, I admit, I had to work at waiting for the fish to bite or the deer to come by my stand, but I finally figured it out. I don’t know if there’s a better way to learn that good things come to those who wait than being on the other end of a fishing pole or in a deer stand. Patience is all about learning to wait, and hunting and fishing are waiting sports. I’m not a psychologist, but I think kids are born with different levels of patience. My brother Jase was born being able to sit still and wait for the fish to bite. John Luke is like Jase. He’s naturally patient. Sadie is more like me. But whatever way we’re born, we still have to learn that having patience is important. That makes me think that when Korie or the kids are doing something that causes me to be late or miss something I want to do, my being patient and waiting on them shows them that I love them. Being patient is totally for the other person. I guess you can be patient with yourself, too, but mostly it’s for someone else. Anytime we focus on someone else and not on ourselves, we are showing the kind of selfless love that God asks of us. Merriam-Webster’s Collegiate Dictionary, 11th ed. (Springfield, MA: Merriam-Webster, 2003), s.v. “patient,” http://www.merriam-webster .com/dictionary/patient. Excerpted with permission from Strong and Kind by Korie Robertson with Chrys Howard, copyright Korie Robertson. Published by W Publishing, an imprint of Thomas Nelson. In your family do you have some who are more naturally patient and some who struggle with waiting? Come join the conversation on our blog!